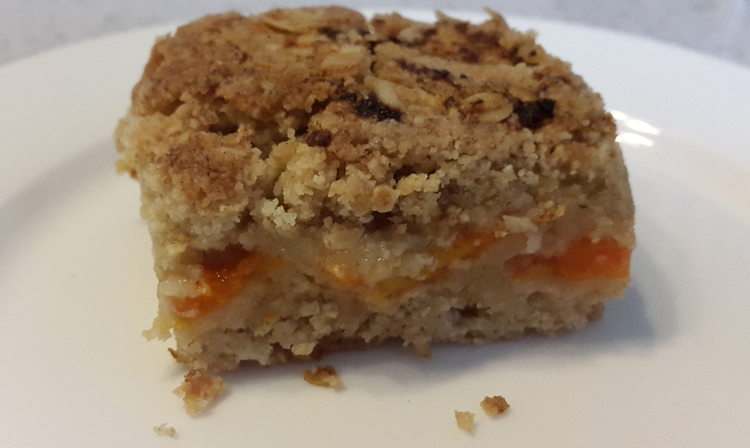 These dairy free apricot bars are so moist and deliciously sweet. A superb fuel food or snack – all good for your gut. I often eat them during my weekly long run, or as a mid-afternoon snack. Very easy to bake. These are based on the date bar recipe. I tried and tested this after being told to stay off any dairy products for 3 months minimum as part of a chronic illness recovery. I’ll continue to bake them this way because they are sooo tasty. Gooey, filling and sweet – they are fab! 200g fresh apricots (stoned weight), chopped in half. Fresh soften so much more than ‘soft’ apricots. To vary this recipe you could easily add a pinch of cinnamon or nutmeg. Also some ground almond. They really complements the apricots. Coconut oil the sides of your cake tin, then line with greaseproof paper. Pour the water into a medium sized pan. Add the chopped apricots and bring to a simmer. Cook uncovered for roughly 10 minutes, stirring occasionally. 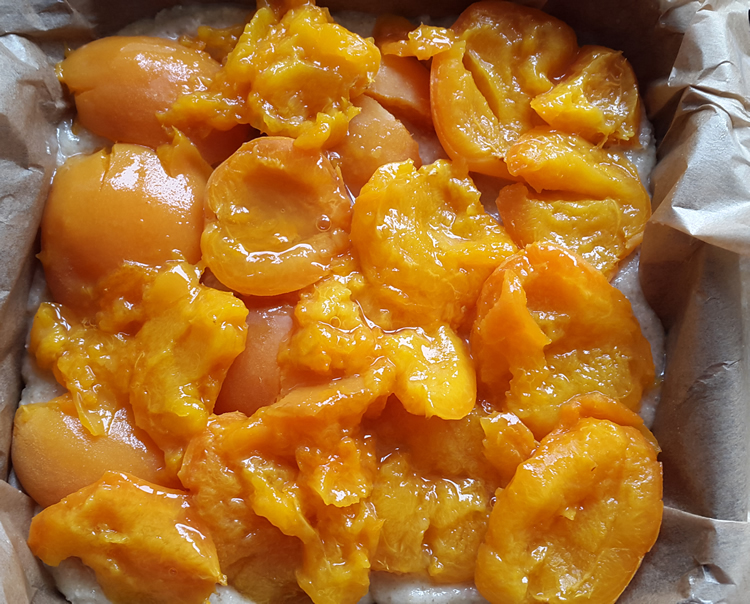 The apricot mixture will soften and thicken. Remove from the heat, dish the pureed dates onto a plate and allow to cool to room temperature. Sift the plain flour and bicarbonate of soda into a large bowl. Add the oats, sugar, salt and mix well. Add the coconut oil, adding a tablespoon at a time, rubbing each in to the dry mixture. The coconut oil will mix very easily indeed so barely needs any effort until moist clumps form. Press half of the oat mixture evenly over the base of the prepared cake tin. Spread the pureed apricots over this. Sprinkle over that with the remaining oat mixture. Press gently with your hand or a wooden spoon to roughly flatten the top. Bake in the oven for around 40 minutes – or until the bars are golden brown on the edges and set in the centre. Cut into bar portions and serve or store. To store: Seal in an airtight box for up to a week. They can also be frozen in tinfoil and are very nice indeed defrosted. These really are an excellent food to eat while out running or as a snack some time before you head out. Oats help to lower cholesterol and reduce the risk of heart disease. Excellent for stabilizing blood sugar – which is also why they can be so good as a running fuel. High in fibre and antioxidants. Apricots are rich in vitamin C, particularly when fresh in season. Rich in antioxidants and adding very few calories to your daily intake. An excellent source of soluble fibre they help contain blood cholesterol. They are also a strong dietary source of catechins – which help reduce inflammation. Overall, very effective for a balanced and healthy diet. 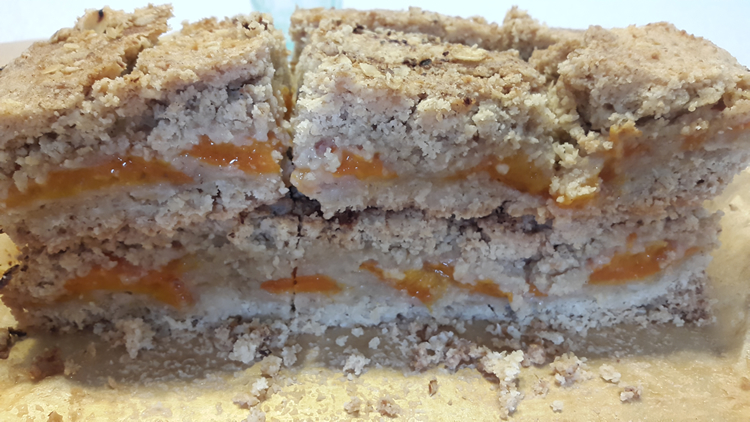 And when baked like this, the smooth texture and sweet taste is really enhanced!